BEIJING (AP) — Beijing is intensifying its warnings to Indian troops to get out of a contested region high in the Himalayas where China, India and Bhutan meet, saying China’s “restraint has its limits” and publicizing live-fire drills in Tibet. Indian troops entered the area in the Doklam Plateau in June after New Delhi’s ally, Bhutan, complained a Chinese military construction party was building a road inside Bhutan’s territory. Beijing says Doklam is located in Tibet and that the border dispute between China and Bhutan has nothing to do with India. It has demanded that Indian troops withdraw before any talks. 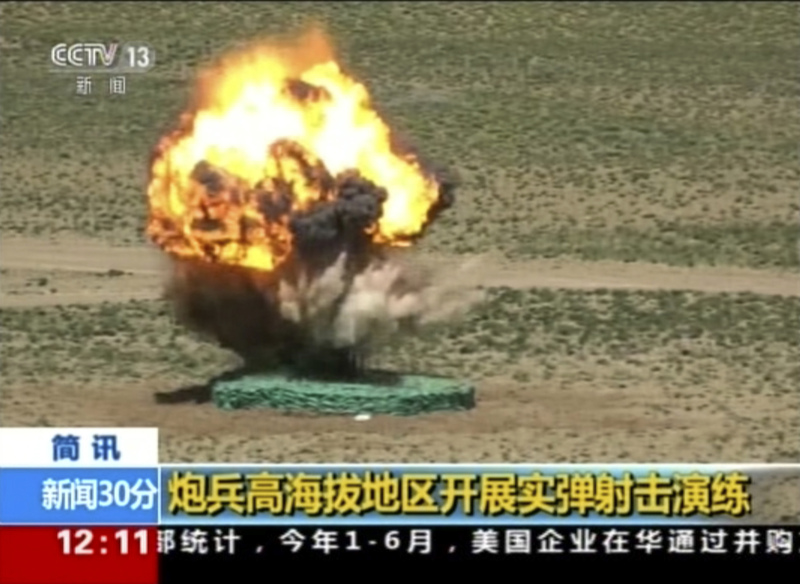 On Friday, China Central Television broadcast video it said showed an army unit in an unidentified part of Tibet carrying out live-fire firing exercises in the past few days. A commander sitting in a vehicle shouted “3, 2, 1, fire!” into two telephones and a missile was launched into the sky. Troops were shown loading and firing other missiles, some of which landed in fiery explosions. The report, which was also carried in other state media, didn’t mention the dispute with India, and said the unit has been training for three months. It appeared to be an attempt to increase pressure on India, however, along with strongly worded statements this week from China’s foreign and defense ministries, as well as in state media. “China has made it clear that there is no room for negotiation and the only solution is the unconditional and immediate withdrawal of Indian troops from the region,” said a commentary Friday by the official Xinhua News Agency. “If China backs down now, India may be emboldened to make more trouble in the future,” it added. “No country should underestimate the Chinese forces’ confidence and capability to safeguard peace and their resolve and willpower to defend national sovereignty, security and development interests,” Ren said in a statement. In New Delhi, External Affairs Minister Sushma Swaraj told Parliament on Thursday that India was concerned about China’s actions affecting the tri-junction boundary point between Bhutan, China and India as well as the India-China border. Experts in India say that by building the road, China may be able to gain access to a narrow strip of Indian land known as the Siliguri Corridor or Chicken’s Neck. If China was able to block the corridor, it would isolate India’s northeast from the rest of the country. China’s Foreign Ministry issued a document Wednesday setting out what it called “the facts” about Indian troops “trespassing” in Chinese territory, calling on India to immediately and unconditionally withdraw and saying Beijing would work with Bhutan to resolve the boundary issue. The document says that as of the end of July, more than 40 Indian border troops remained, down from more than 270 with weapons and two bulldozers who advanced more than 100 meters (yards) into Chinese territory on June 16. In editorials this week, the ruling Communist Party’s People’s Daily said Indian officials and media had “concocted all kinds of groundless excuses” for the incursion. If the dispute drags on into September, it would hang awkwardly over a meeting of the BRICS major emerging economies, including China and India, to be held in the southeastern Chinese city of Xiamen. “India thought wrongly that China would tolerate its actions because the meeting is going to be held soon,” said Chu Yin, a researcher at the Center for China and Globalization, a Beijing think tank.